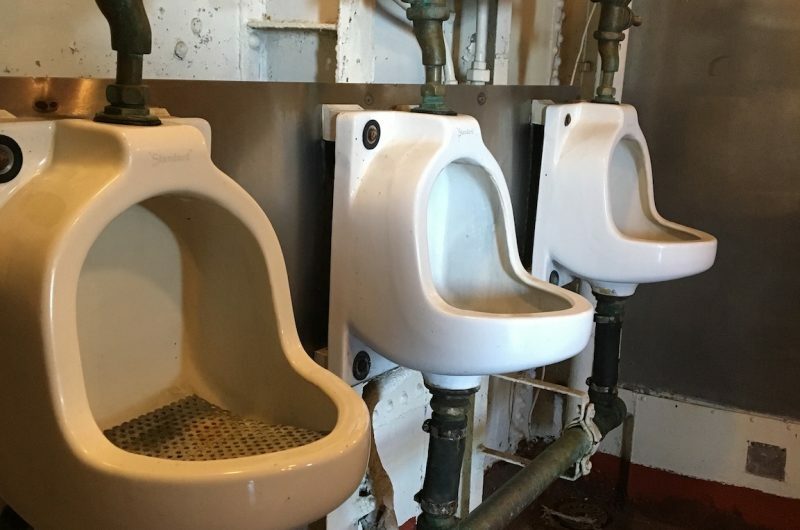 The Aft Enlisted Head is located inside the aft deckhouse on the Main Deck between the ammunition handling rooms for 5-inch Gun Mounts 53 and 54. 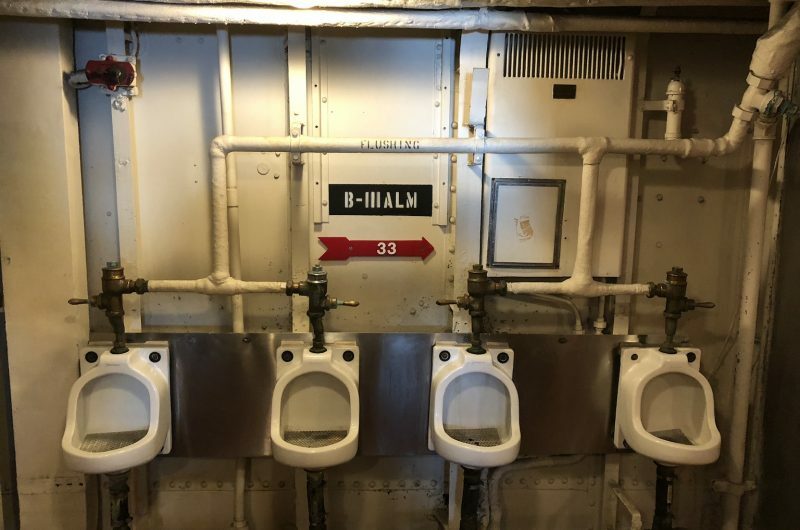 This area contains lavatories, showers, and toilet facilities shared by the one hundred and fifty enlisted men who lived in the after berthing spaces. It was a crowded place at reveille when all hands rushed for the head at the same time. Privacy was scarce and fresh water even scarcer. The ship’s four boilers had priority for the fresh water and, when the evaporator wasn’t working properly, water hours were enforced. When the crew was permitted to take showers, a salt water lather and a quick fresh water rinse were all that was permitted. Though it varied, the average amount of time in the shower was around 45 to 60 seconds; no more. The master at arms kept a watchful eye over the proceedings. In the South Pacific, a tropical shower was cause for all hands not on watch to head topside with soap bars. It was a welcome relief on a hot, sticky ship. The term “head” dates back to the days of sail when the crew would relieve themselves while sitting over the water in the netting that hung from the bowsprit (the long pole from which sails are hung) at the head of the ship. Some later ships had a small closet located at the foc’s’le which had a small opening leading over the side. A bucket of water washed all of the waste over the side and into the sea. 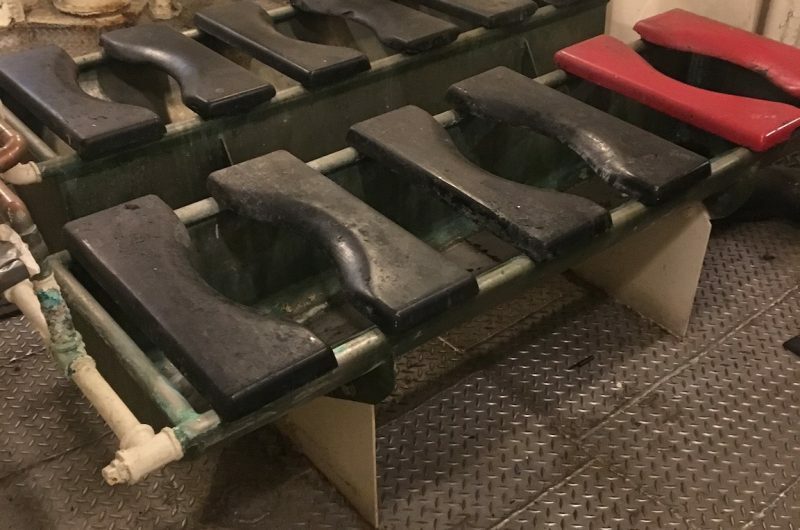 You’ll notice that the toilet facilities in the KIDD’s aft head were almost as primitive, amounting to nothing more than three water troughs with four seats on each trough. Water flowed in from a faucet on one end and departed through a drain on the other. The infamous red quarantine seat was reserved only for those crew members who brought back unwanted “guests” from shore leave. Those particular sailors were confined to the “hot seat” until cleared by the ship’s doctor, so as not to spread infection among the crew. 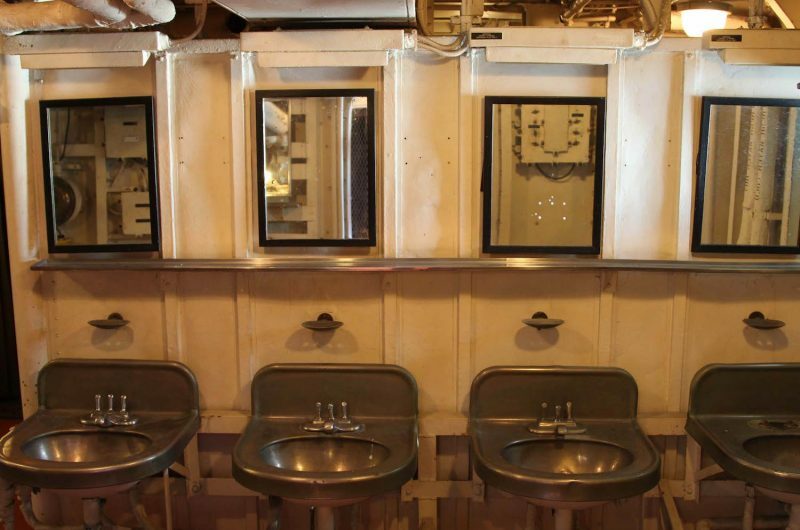 The decks in the aft enlisted head—as in the Galley—are painted red. Both of these spaces were used as an emergency first aid station in the event of casualties during battle. The red paint served as a primitive camouflage to hide the sight of blood from the wounded and to help keep them from going into shock.